as additional insured. This insurance must be in force during the lease dates for the event which are: April 23-29, 2019. 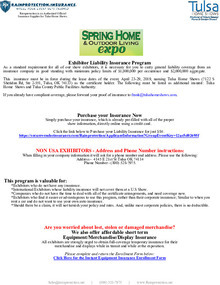 We have made special arrangements with Rainprotection Insurance for Exhibitors that need to purchase event liability insurance. Download this form for full details. Download "Rainprotection - Tulsa Home Shows - Spring Home & Outdoor Living Expo Apl 26-28, 2019.pdf"
Booked for the Fall Show Yet? We also have our Fall Home Expo coming up in November.